The operators at Oakdale will find switching a bit more comfortable with the new flooring. One of the things I had been meaning to do for quite some time was to provide a comfortable flooring for the railroad room. 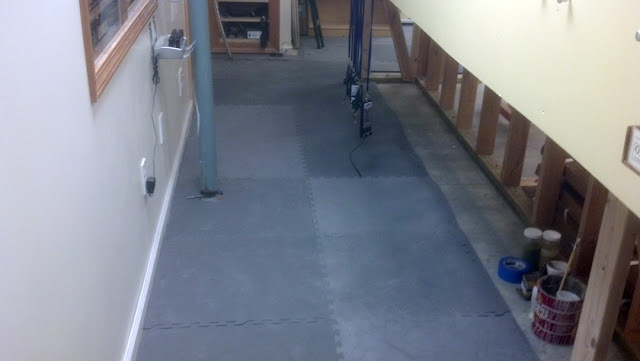 With the layout in the basement, the floor is concrete which is a bit harder on the feet than a wood floor. My first choice of flooring was carpet, specifically carpet squares. With their built-in padding, they can be quite comfortable. The best part is that they could be temporarily removed when working on the railroad. The bad part is that the cost would be in the thousands of dollars so I have just lived with plain concrete for several years. This weekend, I received a flyer from Harbor Freight and found that their foam rubber matting was on sale. It comes in two-foot squares which can be locked together. To make a long story short, I came out of the Harbor Freight store with a bunch of tiles and installed them in the aisles. the total cost was in the low hundreds of dollars instead of thousands. The tiles don't cover all of the floor but they do provide a much more comfortable walking surface that the concrete. Although plain concrete remains in places, it is under the railroad rather that at the walking surfaces. 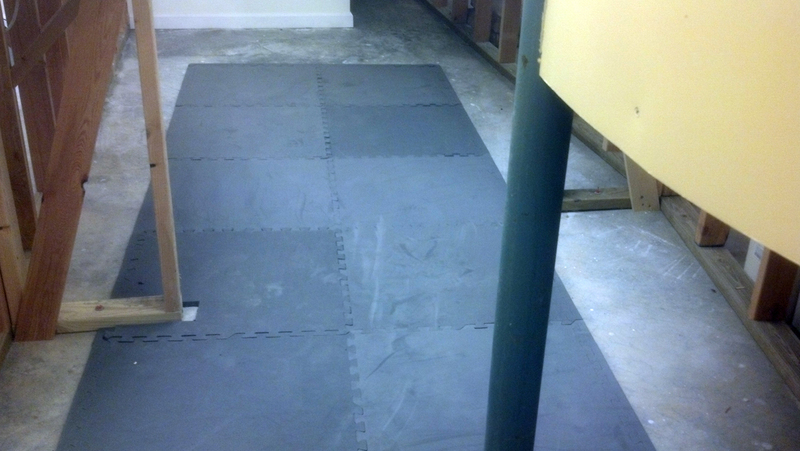 The really big downside to the mats is, fortunately, only temporary. In all the kneeling down and getting up, I found muscles that obviously haven't been used very much. I may be walking funny for a couple of days but it is worth it to finally get a floor down. While the Stanislaus Warehouse looked good to me, it needed some product (sacks of grain) stored on its loading platforms. I could not find any commercially made sacks that looked right to me so I decided to make my own. In looking through my scrap boxes, I did find some sack stacks of that looked right. I don't know who made them but Walthers doesn't carry anything like them so I imagine the company is look out of business. Using these as patterns, a rubber mold was made using Alumilite molding rubber. Bragdon casting resin was poured into the mold and, a few minutes later, I had stacks of sacks. They were painted Floquil Rail Brown which seems to be a close color to the coarse material used in the prototype sacks. The finished castings after painting. The now-finished warehouse looks pretty good to me and I now have the capability to make more as additional grain warehouses are built along the route of the S&C. The construction projects at Oakdale progress with the addition of the Stanislaus Warehouse Company building. The prototype was built in 1885 and remained standing until the late 1990s. I was fortunate enough to measure and photograph it before it was demolished. Originally used as a warehouse for grain storage, it went through a number of other uses through the years. My model of the building will remain as the original, a warehouse for sacked grain. It was reduced to about 3/4 of its length while retaining the same width. The huge loading platform was originally at the south end of the building but I moved it to the north end as it better suited the available space. In the 1990s, rail service to the warehouse had been discontinued. The ground scenery around the building still needs to be applied but there is paint to buy and dirt to sift before that can be done. That big loading platform must have been filled with stacks and stacks of grain. Those will have to be made and cast in resin before I will consider the job done. A recent comment on my oil refinery article in the August MR was complimentary but wished there was information on the typical 1890s oil distribution facilities. Here is some information I put together on Standard Oil's facilities in California. Stations varied considerably in size and equipment. The two largest, located in San Francisco and Los Angeles, by 1896 represented investments of about $53,000 each. The smallest, at San Diego, was valued at about $5,500. 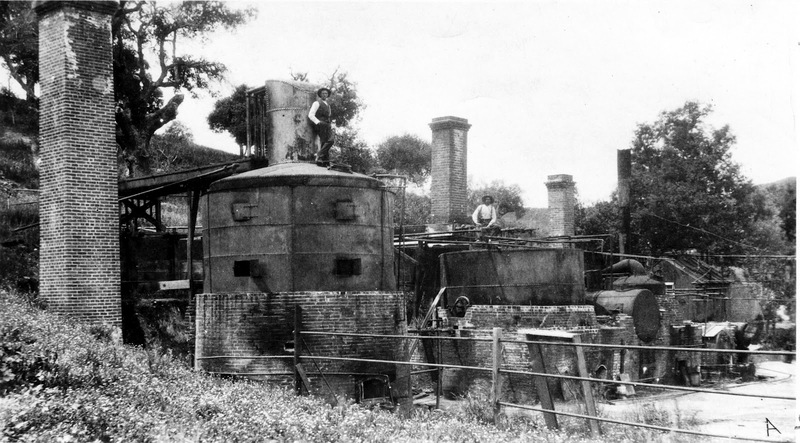 Each station had one or more plain brick warehouses containing an office and storage for cased goods, and several tanks ranging up to 7,000 barrels [42 gallons per barrel] in size for bulk storage. They were also equipped with a pump house, barreling plant and a stable. They kept on hand a thirty- to sixty-day supply. . . .
Iowa Standard supplemented its main stations with depots or substations. 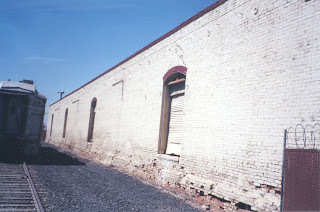 The storage depot established in 1883 at Oakland was a forerunner. By 1890 the company was operating eleven substations and twelve main stations. A decade later, when there were fifteen main statons, the number of substations had grown to fifty-eight. Some were sizable, like the $4,200 plant at Bakersfield, consisting of a warehouse and tanks; others were just a small tank and perhaps a warehouse located on a spur track near some hamlet . . . They were usually staffed by no more than one or two men who were paid a commission. . . . The Iowa company turned to the tank wagon in the more populous areas as the most economical means of distributing oil except for a large delivery direct from a tank car. For the merchant, too, there were advantages. He could retail bulk oil more easily from a tank filled regularly by tank wagon than from an unwieldy barrel, and he was no longer troubled by possible damage from leakage to good stored near his oil. . . .
Standard’s first wagons first appeared on the streets of San Francisco in 1883; by 1890 they had been adopted at all the main stations except Marysville. In that year, the Iowa company delivered about one-seventh of its kerosene by tank wagon. Soon the practice also became common at the substations. By 1900 the tank wagons were handling about one-third of the kerosene sales. 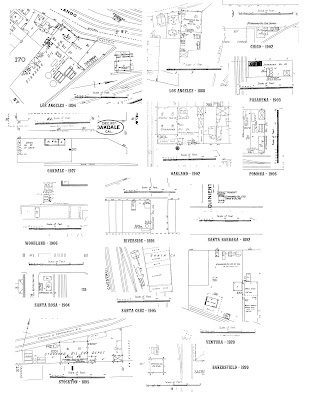 The attached sheet contains Sanborn insurance map depictions of several distribution substations which were located in California. Undoubtedly, a similar pattern was repeated nationwide. The Pacific Coast Oil Refinery at Peters. 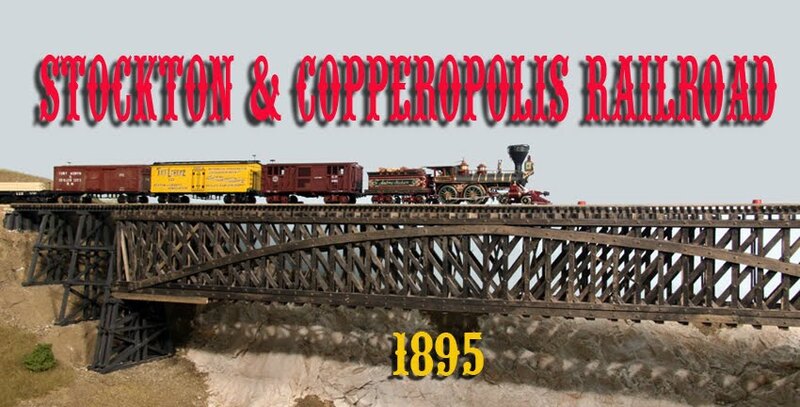 I am pleased to say that the August Model Railroader contains my new article entitled Build an 1880s Oil Refinery. 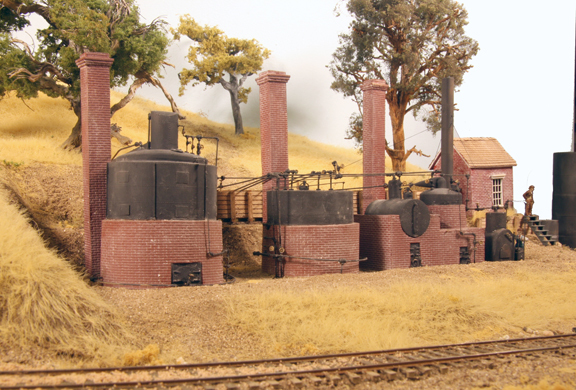 The prototype of the refinery was built in Newhall, California in the 1870s and refined oil from the adjacent Pico Canyon until the late 1880s. Information to build the model was obtained through period documents and on-site measurements of the remains of the refinery. In the 1930s, Standard Oil restored it to its 1880s condition but, sadly, it has since deteriorated through neglect and vandalism. Present-day Chevron Oil was kind enough to furnish several photographs of the 1930s restoration. Thanks to Google Books, I was able to obtain information on the petroleum refining process of the nineteenth century. Quite different from today's goal of producing gasoline, the folks of the 1800s wanted a clean-burning kerosene for lighting. Gasoline was just a by-product. The prototype in operation in the 1880s. Pacific Coast Oil operated the refinery and ran both cylinder tank cars and oil/box combination cars. These latter cars looked like boxcars but contained two tanks for bulk kerosene with a dry space between them. This space was used for canned goods including oils, benzene, etc. It was fun building the structure and my operating crews find it an interesting switching challenge.If this is interesting to you, pick up a copy of the August MR.